Time for a more relaxed form of travel, we set off to be rowed at a leisurely pace around the waterways of Ninh Binh. Our trekking for the last four days has been a terrific experience, we have tramped paths over mountains, through primary forest and along terraced rice paddies. We have stayed along the way in tiny villages that rarely meet a foreigner and have met the most wonderful and friendly people. It is the people, more than anything, which we will remember. They seem to have so few material things, work incredibly hard and yet remain so cheerful and are so welcoming to strangers. It is now time to move on and experience the wonders of the Ninh Binh region. 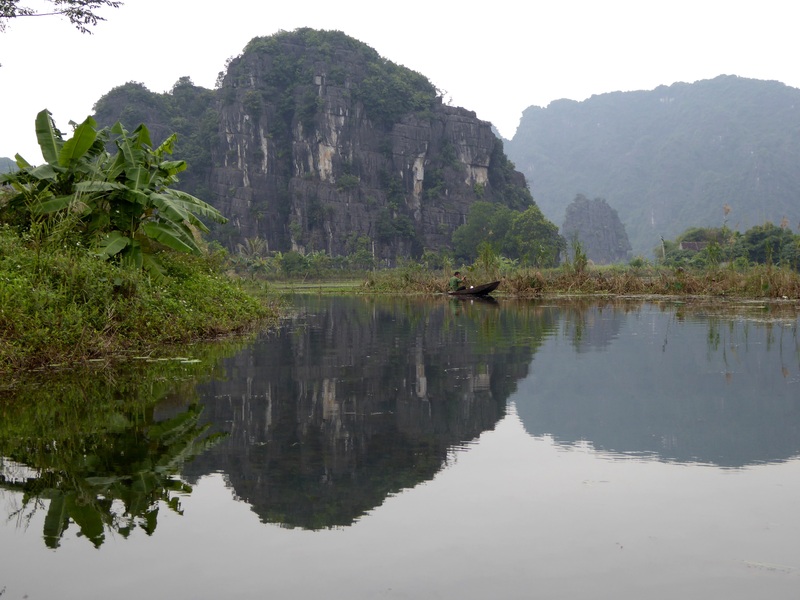 Often described as “Halong Bay on land”, Ninh Binh is a massive wetland area of waterways broken up with limestone karst formations giving it a sort of Lord of the Rings feel. Some parts of the area have been massively over exploited for tourism, but there are still places where it is possible to escape the crowds. Sadly, Ninh Binh City, where we are to spend the night is not one of them. No one could describe Tam Coc or Ninh Binh City as pretty towns, especially after some of the beautiful palces we have stayed at over the last week, but they are close to one of the more spectacular areas of North Vietnam. On arrival Dat, our guide, took us the tourist central area of Tam Coc which is home to more than 400 tour boats! He then explained that his company refused to use this area and so we head off to a much quieter waterway with very few boats or tourists. We pick a boat and are rowed along the waterways for around an hour by a wiry old man that doesn’t look as though he will manage five minutes. He is a lot tougher than he looks and rows us effortlessly along the waterways! Eventually we reach what, from a distance, looks like a sheer rock face but turns out to be a very low entrance to a cave. Our as we crouch down in the boat our oarsman expertly negotiates our way through the stalactites and low parts of the cave roof. With no torches, we are rowing in almost complete darkness until we eventually we literally “see light at the end of the tunnel” and emerge into a tranquil backwater surround by limestone karsts, almost like a secret lake. It is eerily quiet and with lots of butterflies fluttering around. Carolyn suggested that if we were to build a holiday home, this would be the ideal location. Idyllic, certainly, but fetching shopping etc. may be a tad problematic! The exit from our next holiday home! The one still Kingfisherin Vietnam! Goat is a speciality of the local restaurants! The next day our driver drops us off at another boat dock but before we set off on another trip on the waterways, we visit an old pagoda carved into the rock face. Unfortunately the camera battery starts to die so I ask our guide if we can return to the car to get the spare. Dat tells me that the driver has taken the car into Town to get it fixed and it will be gone for three hours. Not wanting to miss out on photographing our next boat trip I take a motorbike taxi to the garage. Along the way I get a “different” perspective of Vietnamese driving and begin to understand why there is so much honking of horns. It becomes self evident that the average Vietnamese has a total different perspective of time and space. Not a great passenger at the best of times, but I have to say that this lady rider was pretty good which is more than I can say for some of the truck drivers who were clearly trying to kill us! Spare battery loaded, we set off on an even more beautiful boat ride with even longer caves and yet more kingfishers dive bombing our boat. Although grey and overcast, this is still an incredibly beautiful part of the country. Along the banks of the waterways life goes on in much the same way that it has done for centuries. People are fishing directly outside there home for fish to take to market. Some are taking to boats and using a less eco-friendly fishing method – a car battery is linked to a copper wire loop on a bamboo pole and the fish are stunned and scooped up in a net. Efficient maybe, but hardly sporting! I guess everyone has to make a living. After lunch at a local house (watched over by the cats above) we set off on a bike ride around the highways and byways and get yet another perspective on this place. Development is happening fast here and, as is too often the case, is not always well considered. Visit before it is too late. Enjoy Vietnam! It’s a special place, for sure! What was the name of the tour company that you used at Ninh Binh? I like that they avoided the heavy tourist area(s). I found this by your comments on a Trip Advisor page. This looks amazing.